It’s getting near the end of this trip, and you can tell. I’m starting to run out of steam, and I’m starting to miss my own bed. Today, I thought I was being very slow to get moving. But I was out the door shortly after 10:00, and walked down to St. Stephen’s Green to catch the City Sightseeing bus. 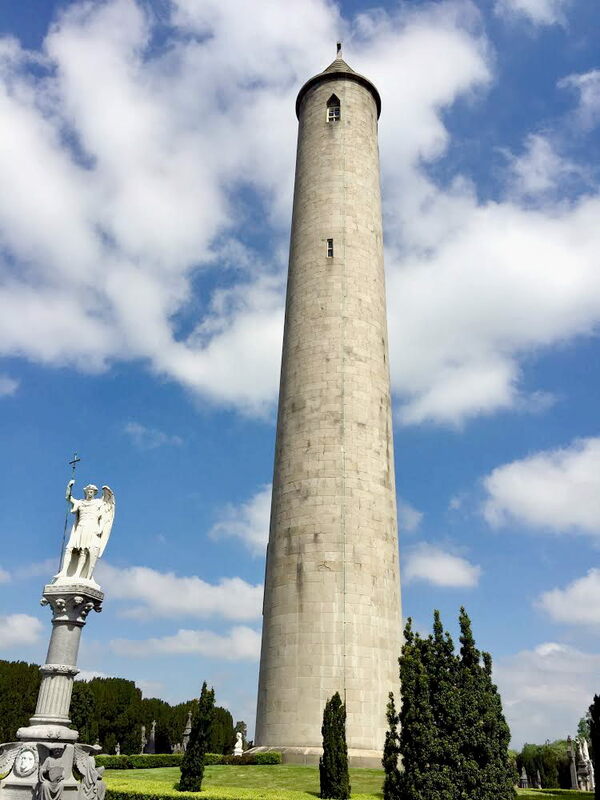 I had a ticket for Glasnevin Cemetery tour, so that was my big plan. The bus timing worked out perfectly. By the time I got to the bus stop, the right bus was just leaving, and it was a nice trip round through the city and all the way out to Glasnevin. And the weather was bright and sunny, again, but it was a little cooler today, and nice and breezy on the top of the bus. Timing was not perfect at the cemetery – I got there just after one tour started, but had two and a half hours to wait for the next one. It was sub-optimal, but I didn’t have any real plans, and it was a nice sunny day, and an interesting place to wander around, so I decided to wait. I’m really glad I did. The tour was fantastic. It started with a re-enactment of Patrick Pearse delivering the eulogy for Jeremiah O’Donovan Rossa, which was very well done. This was one of the sparks that roused people for the 1916 Rising a year later. Jeremiah O’Donovan Rossa, by the way, was a big name in the Fenian movement. He started the Phoenix National and Literary Society, which had more to do with dynamite than books. This was pretty much the way things went on the tour: we walked to various graves and got good stories. This is the grave of Charles Stuart Parnell. He was an Irish MP who almost twice got a Home Rule bill passed. But then a scandal forced him to retire from politics. He gets name-checked in Come Out You Black and Tans1. Any way, he wanted to be buried among the poor that he had spent his life trying to help. There are about 11,500 people in this grave; it’s a mass grave from a cholera outbreak. There was a lot of discussion about last wishes for burial. My favourite is when the guide told a story about the chapel in the cemetery2 – it was very expensive to build. The archbishop who oversaw the construction wanted to be buried in an unmarked grave in the poorest part of the cemetery, with no record of where his body was put to rest. He had chosen as the architect to design the chapel a man with a rather bitter rival, who stewed over the perceived sleight for six years, until the archbishop died. Then he convinced the Glasnevin council to allow him to build the (second) biggest, most impressive tomb in the cemetery. And to put it right in front of the chapel, so that it blocks the view of the chapel from the street. The is the biggest, most impressive grave in the cemetery. It marks the tomb of Daniel O’Connell, known as the Liberator in Ireland. The tomb is under the mound beneath the tower, and you can climb the stairs to the top and get an amazing view of the city3. Daniel O’Connell’s final wishes were, “My body to Ireland, my soul to heaven, my heart to Rome.” His friends, being ever the literalists, brought his body back to Dublin for burial; trusted that his soul would find it’s way to heaven; and cut his heart out, put it in a silver box, and shipped it to Rome, where it was promptly stolen and never seen again. 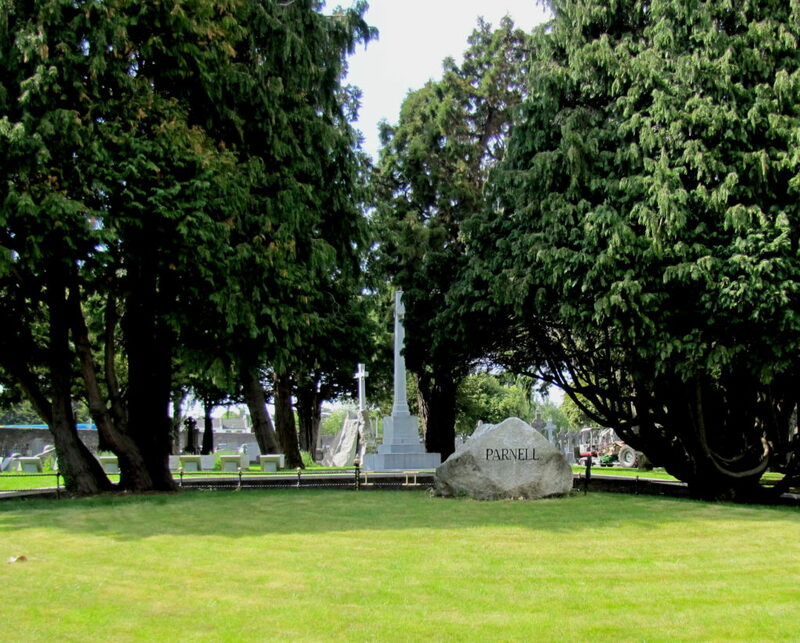 Glasnevin Cemetery was Daniel O’Connell’s doing. 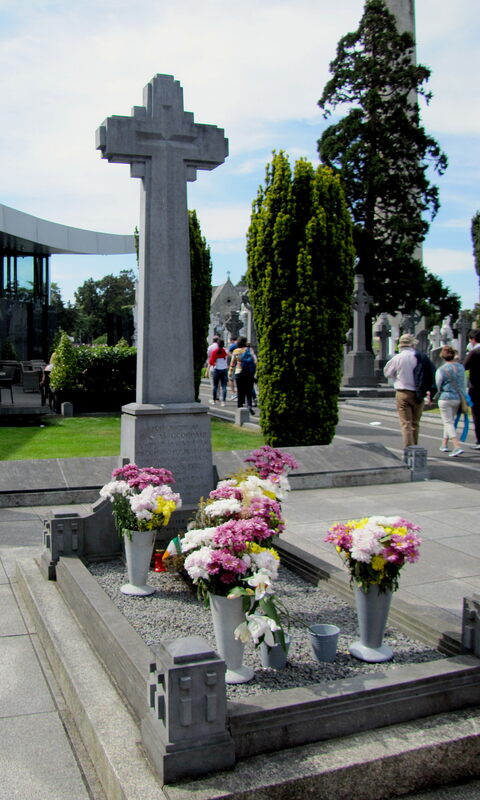 After he managed to get the Penal Laws repealed, granting Catholics legal status and the right to practice their religion, he established Glasnevin Cemetery, because there hadn’t been any (legal) Catholic cemeteries in Ireland for years. But O’Connell set down the rules for Glasnevin that said anyone in Ireland could be buried there, regardless of religion, or lack thereof. This is the most visited grave in the cemetery, possibly in all of Ireland. It’s the grave of Michael Collins. One last little story I got as I was leaving the cemetery: There is a pub called John Kavanagh that’s up against the cemetery wall. The wall was important, because of the prevalence the Sack-’em-up Men, which is what they called the local body snatchers. So, big walls, seven watch towers, all to prevent the corpses being stolen and sold for medical research. Anyway, Kavanagh’s got to be called the Gravedigger’s Pub, and there was a hatch cut in the wall so that the gravediggers could buy beer while working. But Kavanagh’s cut off the practice, because the gravediggers weren’t very good about returning the glasses. So the gravediggers started bringing their own jars to be filled. And thus the Irish slang of referring to drinks as jars. My timing for the bus worked out perfectly, again. I was able to walk from the end of the tour pretty much right on to the tour bus again, and it took me right back to St. Patrick’s Cathedral, which is right across the street from where I’m staying. Tomorrow is another City Sightseeing day. My objective is to see the Dublin Zoo at Phoenix Park. Now that I’ve activated my 72-hour ticket, I can just catch the bus back at St. Patrick’s, so that makes everything easy.